5 Minutes of Fame tonight! 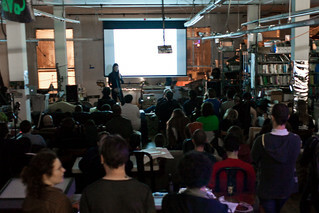 Tonight at Noisebridge, our lightning talk event, 5 Minutes of Fame! I’ll be speaking at 5MoF about Bad Inventions, going back over at least 20 years of my own horrible inventions, some of which came to fruition and some which have not (YET). booleans in a packed byte. * The Battle for OMNIPOTENCE. Who will win? WOOL, MUSHROOMS, or HEMP? Join us as we untar the future! Pkunzip the past! Huffman decode your mind! You can submit talks through the wiki page for future events or MAYBE even for tonight’s talks. Categories inventionsTags events noisebridgeLeave a Comment on 5 Minutes of Fame tonight! My first week (and a half) at Mozilla has been about organizing information. The HR orientation stuff was mostly directions to mozilla.org wiki pages, IRC, and mailing lists, echoing the “Get Involved” path into Mozilla that any volunteer contributor can take. A bunch of the meetings that I joined are public meetings that anyone can attend over IRC, dial-in, video, or Air Mozilla broadcast. Transparency and community inclusion seem to be the default for everything. I made up stuff for myself to do for the first week, with fairly modest goals. I signed up on the Firefox support forum, which gave me a nifty profile and a list of user questions that need answers. I tried answering a few, and looked at other contributor’s profiles. 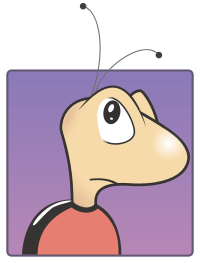 A hard problem led me to Bugzilla, where I had already created an account. There are hundreds of thousands of bugs listed in bugzilla.mozilla.org and it is now my job to understand what’s going on in there. In the next few weeks I’ll be writing about that! 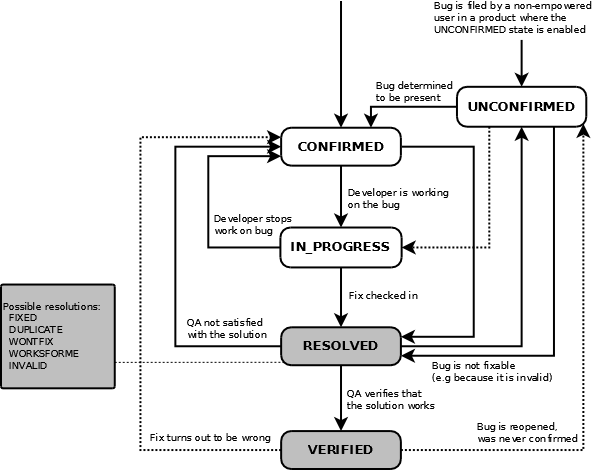 My focus will be not on fixing bugs, but on understanding how to triage them — how to figure out whether they are valid or not, how to mark them up or get and add more information to a valid bug, and how to route the bug to where it needs to go. Rather than zapping, squashing, or stomping the bugs we will tame and herd them! As part of my path into Bugzilla I picked an active product and component to watch through bugmail. Bugs in bugzilla.mozilla.org, or BMO, is categorized by product, such as Firefox, Firefox for Android, or Thunderbird, then, within those products, categorized by component. In my preferences on the site, under component-watching, I picked Firefox as the product and Untriaged as the component, and turned on email notifications. Whenever something in that component is added or changed, I get bugmail. So far this is around 100 emails per day. I set up filters to route that bugmail into a folder and am watching what happens to those bugs, occasionally trying to triage them myself. As I navigate all this I will be breaking down bug triage into various workflows and processes. I’m hoping to expose places where we can write tools to help people sort and triage this stuff. Yes, the glamorous life of a bugmaster! Join our cult! Or, at least, our #bugmasters IRC channel! The Bugzilla for Humans video is useful as an introduction. 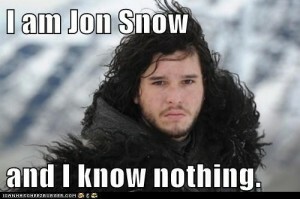 And there is a weekly QA triage day that I will be going to. The Mozillians doing this bug wrangling have a huge amount of expertise. I feel so humbled as I watch the flow of information coming into these systems and see what they’re doing. As part of coming into an open source project to contribute to it, I have to accept that I know nothing, things are confusing, and it will all come together as I go along. It’s inspiring, and I want to live up to its awesomeness. 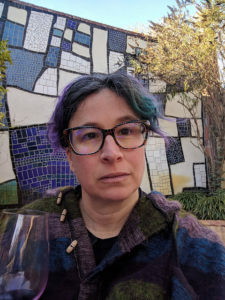 Being a contributor to Mozilla is amazing not just for the individual people I’m meeting, but because I’m seeing a huge, organically created, largely self-directed system at work. It has a strange beauty. I have two more bad inventions to add to the world, both cat-related! Think how awesome it would be if we had cat treats that had the varied textures of dead mice! Pampered indoor cats could have the fun of chewing on the leathery outer skin made of meat jerky, crunching the fake bones, savoring the squooshy fake guts, and dragging the horrible fake mouse around by its meat jerky tail to leave it on your pillow as a gift. Dead mouse cat treats would be totally amazing and also the worst invention ever. 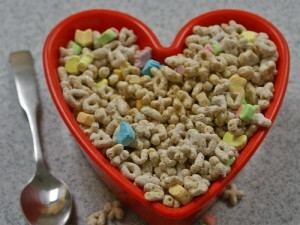 Except for … 80s sugar cereal cat litter! I thought of this yesterday while cleaning the litter box. We accidentally have an extra-rancid smelling brand of cat litter right now. Imagine a half assed attempt to make cat litter smell pleasant! It could smell just like Lucky Charms, or Frankenberries or whatever, and look like it too… the little blue odor-crystals would be the marshmallow bits. The cat litter containing boxes could look excitingly like breakfast cereal boxes perhaps even with fun prizes inside for that ultra-hipster retro enjoyment of life… but the prizes would be FOR YOUR CAT. As an extra bonus, you can combine both these inventions so that your box of Lucky Charms Cat Litter contains a Dead Mouse Treat prize. Past cat-related inventions include Cat Eggs and the Catula. Other inventions from today: Feminist Bitcoins, the Social Justice Slot Machine, and the charitable causes first person shooter (“Give a hoot, shoot & loot!). I spent yesterday in the San Francisco Mozilla office, meeting people, setting up my laptop, and getting a general orientation. It’s in the Hills Brothers Coffee building across the plaza from Google, so I went past a hilarious statue (too late from the bus to study it in any detail) into a marble-floored entry hall and into one of those dark woodpaneled elevators with a mirror that are successfully posh, but need cheering up or art on the wall or something to look at other than the reflection of elevator-awkwardness. In elevators I have the choice of lining up my wheelchair or scooter foolishly backwards to back in, then emerge with dignity; barrelling in over-fast to jump the gap and scaring anyone already in the elevator, then waiting facing the “wrong” way; or, jumping the gap forwards and then executing a clumsy or neat 7 or 5 or 3 point turn which definitely scares everyone else’s feet. Sometimes I forget to slow the scooter speed and crash into the elevator wall. Enough about that! The 7th floor is more cheerful, light, full of colored couches and enormous refrigerators and baskets of candy and snacks enough to feed armies of squirrels. An extremely nice person named Peter gave me a laptop and pointed me at a videoconference set up on a tablet in a sort of tablet holster with headphones so that I could be in the HR orientation, which was fairly painless and lasted about an hour. I am one of the first batch of new hires to go through their new “onboarding” system, which has been bombarding me for a week with exhortations to Join the Glorious Mozillian Cause, Comrade, join every mailing list/newsgroup/irc channel in the world, and fill out my forms. It seems a good system. “Firehose” is too weak of a term. I kept notes on all the tiny errors in the process, throughout last week, to report them in batches. I felt that I was already working there, without being paid, which, well, why not when they are so awesome and it is free/open source and a huge worldwide volunteer community! Onwards!! I spent some time last week, and then, much more fiercely yesterday, coming up with ways to organize these huge tributaries of information and systems for myself to skim off the bits necessary to move something forward, respond or act. I feel like a little space station way out somewhere, beginning to turn on its ansible and light up, coming online in a giant network of ships and stars. Right, where was I. I was introduced as a new hire at an amazingly competent video conferenced short Mozilla weekly meeting. I had already looked at past meetings while studying up on what was going on at the company, to interview. Then was on irc, on the #qa and #ateam channel, then meeting the Bugzilla team who are in town for the week and who were very amiable. I wonder if they would like to come to Noisebridge? It is amusing to work at a grownup job where people are introduced to you with names like “glob” and “potch” and it is normal for me to be named “lizzard” since it has been my irc name for forever. I listened to the Bugzilla folks for a while. They super nicely offered to take me with them tomorrow on a datacenter tour, where I will arrive as a sort of wheely cyborg surprise to whoever is squiring us around. Then had lunch (free, catered, very nice lunch on Mondays) with Lukas Blakk, ran into Tantek, met Boris and Dave and the guy with the purple mohawk, and Heather who showed me around the building. My cube is in a somewhat depressing cube farm on the 3rd floor, but everyone was super nice and I decided to work in the community room on the 7th floor where there is a beautiful view of the Bay Bridge and the water. There are couches on the roof, and tables to work at. Lukas and I hung out (we know each other from geekfeminism.org already) and I got to see a lot of great and promising stuff built on top of Bugzilla’s API, just the sort of thing I was hoping to (someday) build to visualize Mozilla’s bug data. All shall triage bugs with me and despair make awesomeness possible! Categories open source workTags mozilla workLeave a Comment on First day at Mozilla! In the last week or so I’ve read a lot of novels by Rebecca West. I tried to read her nonfiction about Mexico but couldn’t stomach her archness. Maybe later. But I loved The Birds Fall Down, and The Saga of the Century, enjoyed bits of Return of the Soldier (seeing the promise of Saga of the Century in it, thought it made me angry) and The Judge. 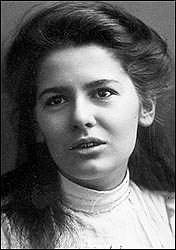 There must be good biographies of Rebecca West, surely!? Her work ought to keep me going through the holidays, or lead me somewhere else just as good. This morning I read a little zine or booklet from my poetry shelves called New Work by Corrina Bain. It might have come from a zine library, or from the poet if we met at a reading, or from the free box at a bookstore like the excellent poetry bookstore near Harvard with the steps and the very kind lady who brought out some boxes from the back of beautiful old “chapbooks” (a word I loathe because it sounds like chapstick, greasy and cheap, and trivializing) The poems are a little prosy for my taste (like a memoir told in verses) And there are some poems of the style of bald statements pounding one after the other to form a sort of holograph. Bain has a good sense of line breaks, so that even when I am protesting internally about the prose bits (which most people like and which speak well at poetry slams; it is only me who bridles at them…) I see her mastery of art and am pleased. The stories are of gender(queerness) and the City; the densest one is called “Uterine”. I would read more! I am reading “La ciudad deshabitada” by Ernesto Cardenal and the translation by Steven F. White, in Poets of Nicaragua. Cardenal’s long lines, and long thoughts, are very beautiful, mind-expanding to encompass. Ciudad deshabitada: anti-colonialist, utopian, revolutionary. Though I am an atheist I am also enjoying reading about his utopian/consciousness-raising/cooperative colony, Solentiname. I can’t read Cardenal’s poems thinking of religion either… I just think about science fiction and space, moody novels of failing space colonies, dystopian warnings about technological solutions to social problems. I wonder if that is outrageous? 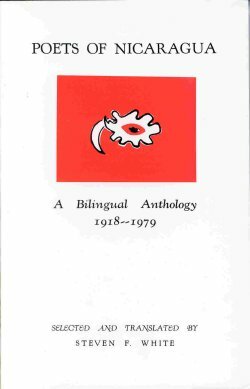 Anyway, I’d like to read the entire book La ciudad deshabitata to see the poem’s context for Cardenal and what else was going on in his mind at the time. Solentiname sounds a bit.. touristy now… Huh.